Wait until you smell this all through the house. Your family is going to come home and think you've been slaving over the stove for hours. This is so easy and only requires a few things from your pantry. I use two boxes of Stove Top Stuffing Mix. Just open them up and dump them into your crock pot. Then chop up 1/2 to 3/4 of an onion (depending on size) and two stalks of celery. 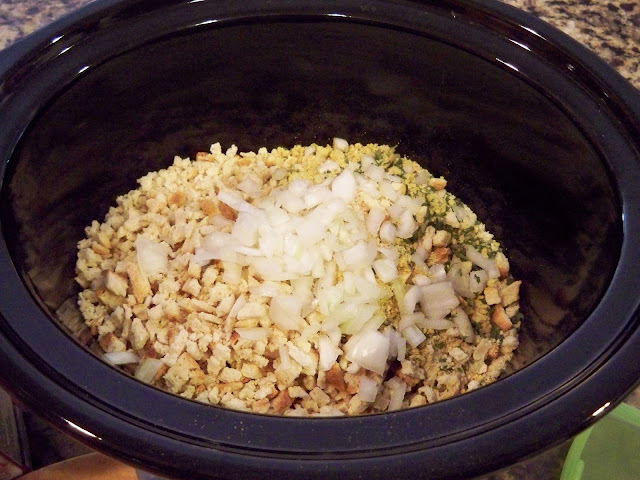 Just dump the onion and celery on top of the stuffing mix. Add enough water to create soft and fluffy stuffing, then top with some dollops of butter. I always buy my chicken breasts (boneless) from the meat counter because they are so much bigger than in the packages. Just look how huge these two are. Dollop a few pats of butter on the chicken breasts too. 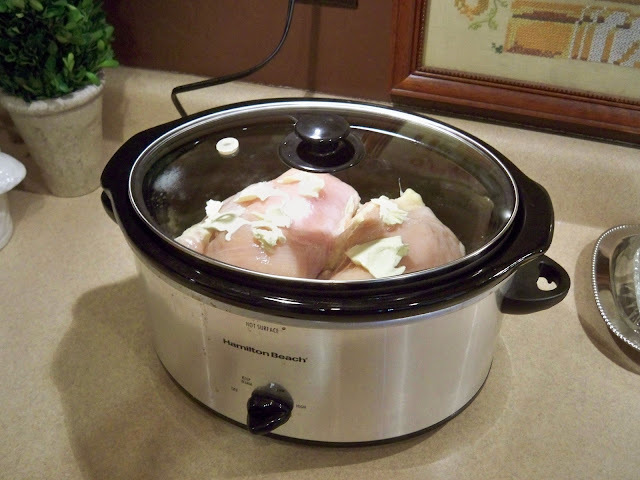 Plug in your crock pot, turn on high for 4 to 6 hours or you can cook on low all day if you are at work. Time will vary depending on your unit. 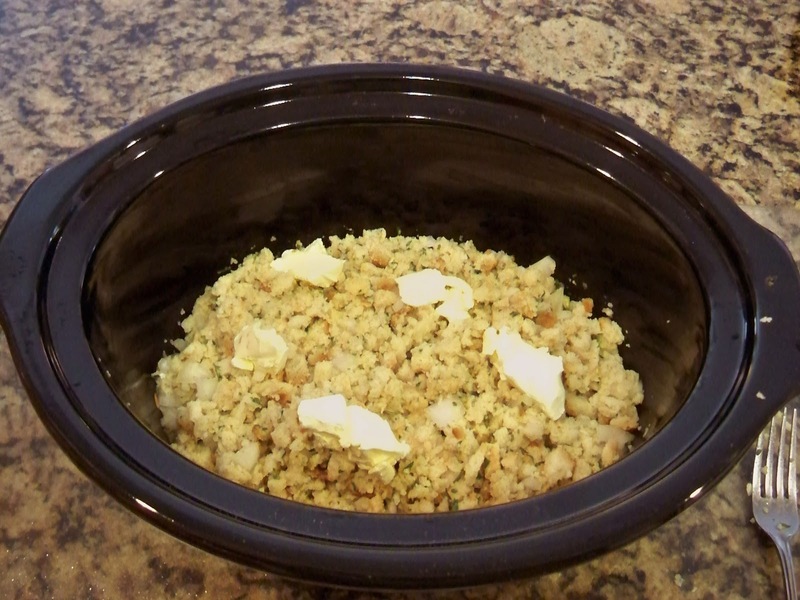 water - enough to moisten the stuffing mix to a fluffy consistency. Place all the ingredients in crock pot, stir to mix thoroughly & dot with 4 pats of butter. 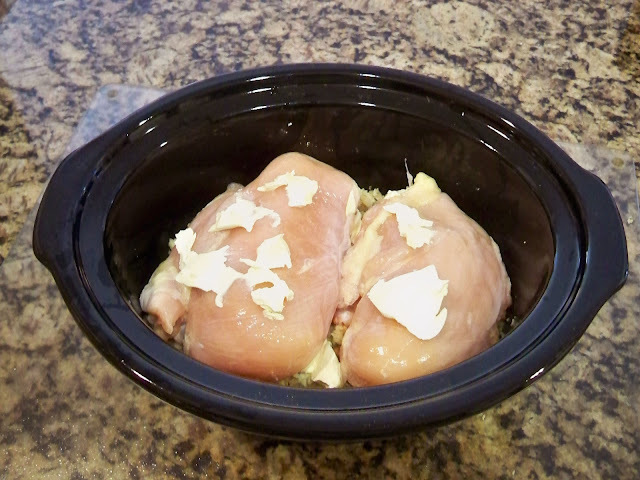 Put 2 large boneless chicken breasts on top, dot with the last of the butter. Turn on Crock Pot to high 4 to 6 hours or low 6 to 8 hours. Time will vary with your unit. This makes enough for 4 hearty meals or 6 smaller meals. All you need is a green vegetable or salad and you have the making of a meal to remember. I added yams and cranberry sauce since that's my hubby's favorite. The chicken is so juicy and delicious. You will love this. Our family loves Thanksgiving, and with this recipe I can have Thanksgiving any time I want to. Do you have some family favorite that is warm and yummy? I love crock pot recipes and this one sure looks like a winner. The next cold day, I am making this! 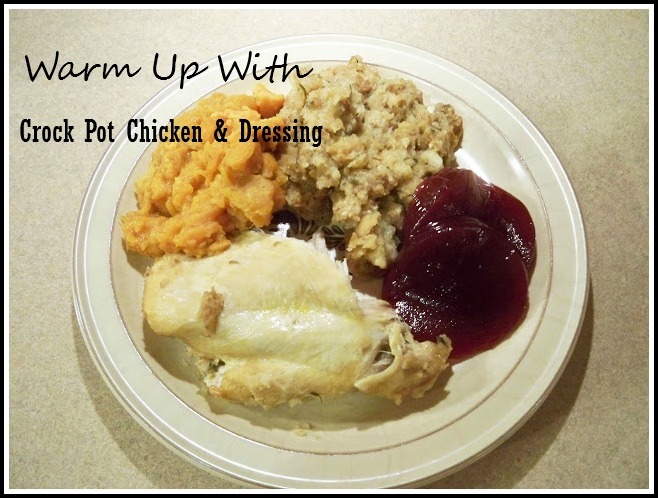 This recipe is very much like my crock pot chicken and dressing! It really is delicious. Thanks for sharing your recipe and enjoy the weekend. That's a great tip about buying from the meat counter. I can even make this! Think I'll leave out the celery. I don't like celery. This looks really great! I will make this for sure! That does look very good and easy. Thanks for sharing. It was close to 70 today, but next week back down to the 30s and snow. This sounds amazing! Can't wait to try it - pinning!! This looks heavenly, Marty! I love a good shortcut and I know this must make your home smell like Thanksgiving. I will definitely try it. This looks delicious! 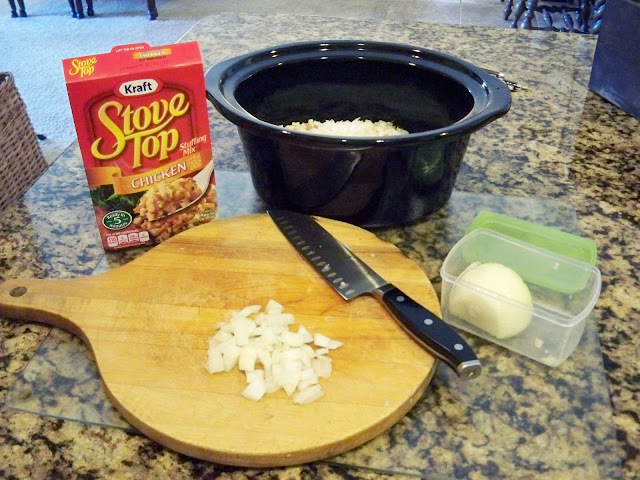 I love dressing and never thought to use Stove Top in my crockpot. Sounds like a great recipe for company next weekend. Thank you! I can smell it here in Fullerton and I sure wish I had some right now. I love love love stuffing and with that chicken, yumyum. I also like to make fresh cranberry relish and always keep a few bags in the freezer. Thanks so much for this great recipe. I am going to make it for next Sunday's dinner. Aren't we having some very unusual weather - going to be 90 on Monday.